After all my experiments, now I'm able to use OpenHAB with familiarity; so now it's time to build my first sensors. Let's start from the kitchen where I would like to monitor gas, temperature and humidity. I added a led used for the indication of network activity and a connector used for external power. 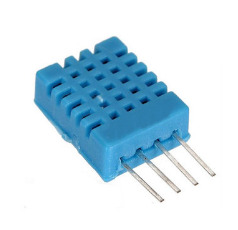 The device will be powered through a little 5V 450mA power adapter, connected to the blue terminal blocks. In this way I could power up the device and also the sensors. The led, ds18b20 and DHT11 sensors are linked to digital I/O and the MQ-4 gas sensor to the analog one. Now it's time to write the firmware...I use Visual Studio Code with platformio extension; I think it's better than the Arduino IDE (personal opinion). I chose this IDE because it also has an extension for openHAB that let me edit configuration files in a better way (just like Eclipse SmartHome Designer). My device will connect to the MQTT broker of OpenHAB through wifi, fetch the data from the sensors and send them as json formatted string with nodemcu/mainfloor/esp8266mcu11/temphumiditygas/state topic. The sample period is 5 seconds and each 60 seconds the average data will be sent to the MQTT broker. When the data will be sent, the green led will blink twice. 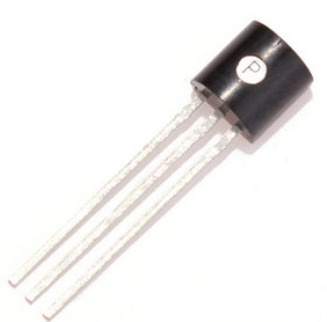 The gas object is related to the MQ-4 sensor, the tempHum object is related to the DHT11 sensor and the temp object is related to the ds18b20 sensor. For now I decided to use both sensors for temperature reading; so I can compare them. Now it's time to setup OpenHAB...and build a new dashboard on Grafana. Last step: adding the device to the network monitoring...so OpenHAB will notify me when the device will be offline. So, using PAPERUI I added the device using the Network Binding and create the items. Then I added the gNetworkCheck group to the "status" item, so its network presence will be monitored by OpenHAB. I chose InfluxDB as persistence engine in OpenHAB also because it is easy to integrate with Grafana, an open source visualization suite that let us build interactive web dashboards. I installed Grafana on my Raspberry PI3, where already run OpenHAB and InfluxDB, using the Openhabian configuration tool (openhabian-config), choosing "optional components". Then, I'm able to reach the suite through http on port 3000. The process to build dashboards is very easy...as long as you define your InfluxDB data source. In the last few days I studied the "persistence" service in OpenHAB v.2, just to store acquired data and be ready to create dashboards. I chose InfluxDB as persistence service, a time series database, easy to integrate in Grafana, a web platform for dashboards creation. 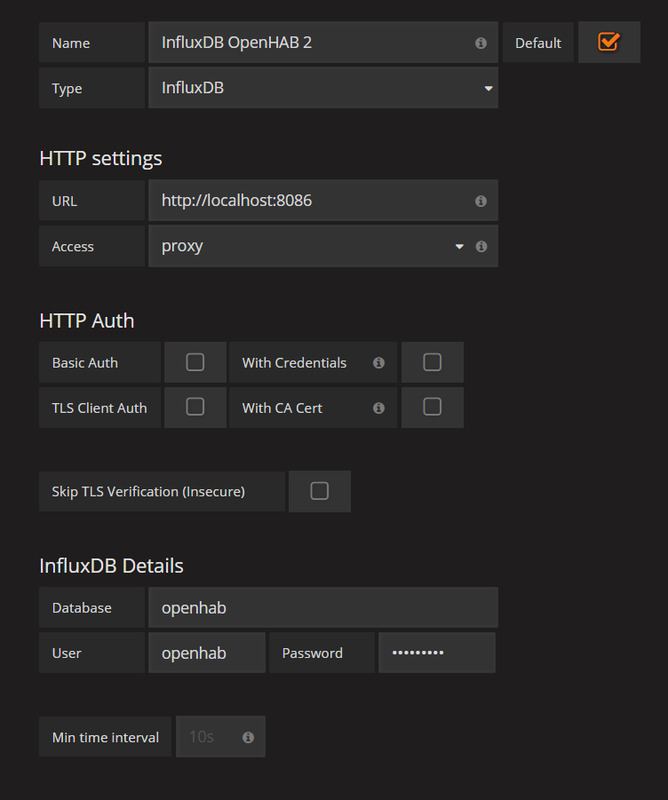 Then, OpenHAB must be configured with the InfluxDB connection info, editing services/influxdb.cfg file in the usual OpenHAB configuration folder. In my case, I used all the default options, so I just entered the password. Now it's time to build the persistence strategy to let OpenHAB knows how store data on InfluxDB; in a few words I have to decided, item for item, when datas will be stored on db. I can choose between many options: on every change, on every update or by time schedule, using Quartz syntax. To do so, I created a new configuration file in the /etc/openhab2/persistence folder, called influxdb.persist. In this file I defined which kind of persistence strategy I will use (Strategies section...) and assigned them to items and groups (Items section). everyMinute: "0 * * * * ?" everyHour: "0 0 * * * ?" everyDay: "0 0 0 * * ?" In the next post I will speak about Grafana, a powerful tool to build dashboard. Introducing the openhab groups in my setup, I improved my network monitoring. I created a new group called gNetworkCheck, which will be assigned to all the network devices I would like to monitor. This group will be ON when all items will be ON, otherwise OFF. Then I changed the monitoring rule, defining it only for the group and not for every device; in this way, I could add a new device to monitor simply assigning it to the gNetworkCheck group; no new rules to write. Following a tip found in the OpenHAB forum (https://community.openhab.org/t/determining-the-triggering-item-in-the-body-of-a-rule/2654/4?u=alex73) I'm able to identify the item changed, which I added to the notification message. Another step forward with OpenHAB v.2...let's speak about "groups"; reading the official documentation (http://docs.openhab.org/configuration/items.html#groups) and studying them I discovered that they aren't simple labels to categorize items but they can be used also as particular objects to be added in the sitemaps, they can be used inside "rules" and may get a real value, derived from the linked items. They may also receive commands which will be forwarded to the items inside them. A "group" is a special item with some differences. It is defined in a .items file in the folder /etc/openhab/items. So I create a new file called groups.items with some groups which I will use later, going forward with the openhab configuration. Groups may be nested and so it is possible to create a real hierarchical design. The syntax is very simple and you can find it in the official documentation. These groups can be put into the sitempas, so their values will be shown (if applicable...) and, click on them, you can see all the items / groups inside them, making a real hierarchical presentation. For example, referring to the gLightSwitchGarden, we could add other groups for all the light switches in the house: gLightSwitchFirstFloor, gLightSwitchMainFloor, gLightSwitchGroundFloor (inside them we will put the light switch item...). Then, we create a new group called gLightSwitch linked to all of them. Adding the gLightSwitch group in a sitemap we could browse all the light switches with a couple of click; sending command to gLightSwitch we will drive all the light switchs together. Just to go deeper in the learning of the OpenHAB v.2 world, I tried to design a little and simple local network monitor tool. Beyond the configuration parameters described in the official docs (http://docs.openhab.org/addons/bindings/network/readme.html), I also used the one called "Location", just to identify the real location of the device. I decided to use the floors and the garden as location choices. So my home router is at "first floor" location. After all devices was added, the first test is to have a look at the "Control" menù, by selecting the "First Floor" location. Switch item=HomeRouter_Online label="Home Router" icon="switch"
Text item=HomeRouter_Time label="Home Router Time [%s ms]" icon="network"
Text item=LamanNAS_Time label="LamanNAS Time [%s ms]" icon="network"
(HomeRouter_Online/Time and LamanNAS_Online/Time are the names of the items as we can see on Paper UI). As we already know reading the official TASMOTA documentation (https://github.com/arendst/Sonoff-Tasmota/wiki/Upgrade#firmware-binary-sources), @smadds user manages a public MQTT broker "sonoff.maddox.co.uk:1883", where he publishes the last version number of the TASMOTA firmware using topic sonoff-version. So, in my setup, I just added an "item" linked to this value, through MQTT and then published it on my sitemap. My item is called SonoffTasmotaVersion, its type is "String" and it is linked to the mqtt connection called sonoffmaddox-mqtt, topic sonoff-version. In this way, this item will be updated everytime someone will publish new messages on topic sonoff-version. Last step: I added my new item to the sitemap, just to keep tracking of the last TASMOTA version. To be more useful, I created a new OpenHAB rule just to be notified every time the TASMOTA version will be updated. Now I have to wait for the next TASMOTA update just to check that all is working as expected. 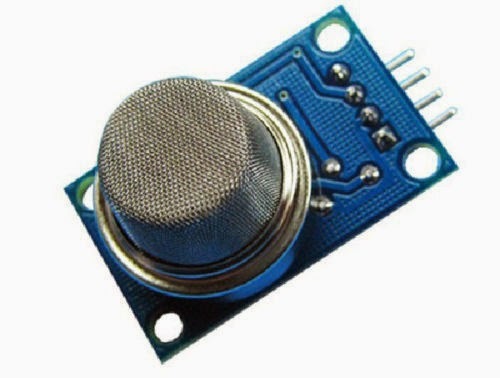 The easiest way is to use a button directly connected to the physical button pins in the SONOFF. I already made a test with my first SONOFF Basic, as described in a previous post(http://domoticsduino.blogspot.com/2017/08/home-automation-system-sonoff-and-mqtt_19.html). In this way we could activate and deactivate SONOFF as we do using the physical button. But I need to control the SONOFF through switches too. Reading the TASMOTA documentation, I discovered that I could connect a button / switch to the GPIO14 pin. Then I could tell TASMOTA what kind of object I connected...if a standard button or a switch. To do so, I have to connect the button / switch to the GPIO14 pin and to the GND pin on the board; both of them are easily reachable. The GPIO14 pin is the one which is not utilized on the serial interface, and the GND is just beside it (already used for the serial communication). In the configuration menù of the web interface, I choose 09 Switch1 as the new value for GPIO14 drop down list. 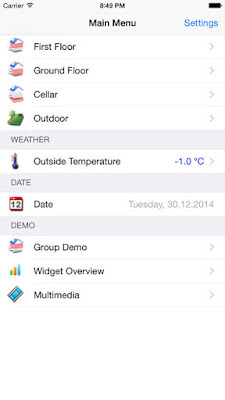 It's time to integrate MQTT and OpenHAB v.2. As already said in a previous post (http://domoticsduino.blogspot.com/2017/08/home-automation-system-sonoff-and-mqtt_19.html), actually I have a SONOFF Basic already installed which drives a garden lamp. As we already know, it's already setup with MQTT and so let's start the OpenHAB integration. Now I have to setup the MQTT connection to the MQTT broker which runs on the same Raspberry PI 3 as OpenHAB 2; so I have to edit the configuration file /etc/openhab2/config/mqtt.cfg directly through the linux shell (nano or vi) or using Eclipse SmartHome Designer, an advanced text editor optimized for OpenHAB v.2 configuration files. I used it. Its setup is very simple and then it needs to know the OpenHAB configuration files path. In my case I setup a network drive (called Z) for a samba share automatically defined by the installation of openHABianPI. 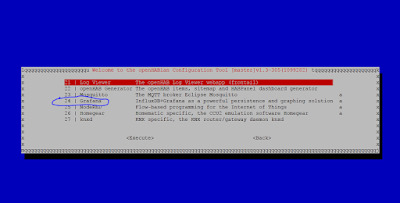 openhabianpi-mqtt is the logical name of the MQTT connection; in OpenHAB we could have many MQTT connections and in the items configuration we use this name as reference. Ok, now I will configure items and the sitemap . 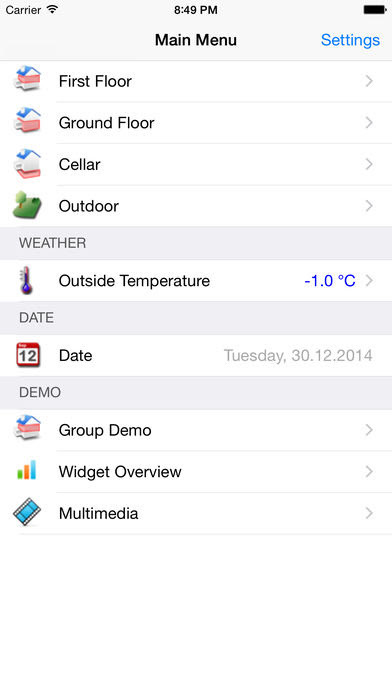 So, I created a file called sonoffbasic01.items in the folder /etc/openhab2/items in which I setup my new items. Switch item=Garden_Light_1Lamp label="Garden Light 1 Lamp" icon="switch"
A new mailbag...a brand new SONOFF Dev...bought directly from the iTead ecommerce website...for just 7 euros, shipping included. 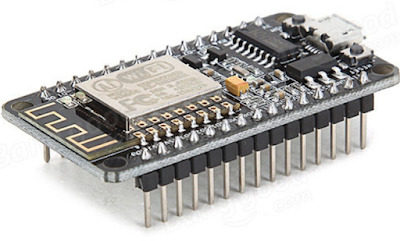 In a few words it's an electronic device based on the famous ESP8266 chip. It includes WiFi connectivity, 5 GPIO, 1 ADC, a serial port and 3.3V or 5V output pin. It already included a micro USB connector to plug in the PC or to connect an external 5V power supply. It supports Arduino IDE programming. It has no default firmware and so you need a little programming knowledge. In the next days I will do some test and then I'll try to integrate it in my Home Automation System, linking some sensors. For me this is a new "world" and so I will follow the official documentation (http://docs.openhab.org/introduction.html) and the community too (https://community.openhab.org/) where you can find a lot of useful infos. In simple words (and based on what I understood), OpenHAB v.2 makes a link between the devices (real or virtual...), called "things", and logical entity, called "items". The items will be used to manage the "Home Automation System". All data which will transit over the OpenHAB v.2 Communication Bus can be stored through persistence engine called "Persistence"
I will try to explain all of these concepts as I move forward with my configuration. 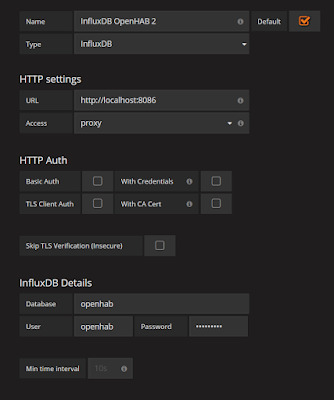 - Reverse proxy SSL with auth, using NGINX , to securely expose on internet OpenHAB e Grafana. There are lots of others modules; see the ADDONS section of PAPER UI. Windows OpenHAB App, also for Windows 10, but it seems a bit "young". Just to become familiar, I will try something easy; later I will try to integrate SONOFF with MQTT. First of all, I follow all the beginner tutorial, just to become familiar with the environment and having no real device like LIFX lamp or KNX device, I decide to integrate speedtest and weather data, provided by external services. In other words, OpenHAB v.2 will run speedtest-cli shell script (a textual interface for the speedtest service) at regular time interval (I set a 2 hours refresh), stored its result in item objects and then link these items to a user UI. For the files configuration, I used Eclipse SmartHome Designer (http://docs.openhab.org/configuration/editors.html#esh-designer), a graphical editor which provides some facility.